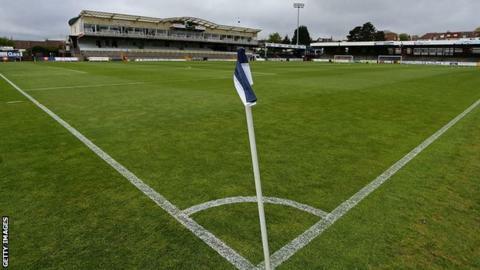 Bristol Rovers president Wael Al-Qadi is keen to include a safe standing area as part of a revamped Memorial Stadium. Rovers are seeking to redevelop their present home after plans for a 21,000-capacity stadium at the University of West of England fell through. Al-Qadi told BBC Points West: "You have safe standing now being revisited and I'm very interested in that. "I'm very interested in creating a stadium that's very cosy, where fans can create a good atmosphere." In June, fellow League One club Shrewsbury became the first club to apply to have safe standing and a crowdfunding campaign has started to raise money. The UWE proposal would have involved the sale of the Memorial Stadium in Horfield, where Rovers have played since 1996. But Al-Qadi says that redevelopment was always an alternative option if the club failed to agree terms with UWE. He added: "It's very important for a football club to own its ground. If you look at examples in history, clubs that do not own their stadiums eventually run into problems."